and greedy men. Even in the court and camp of Runjeet, the Akalee free-booter was an object of dread ; and he, presuming on the terror which his name inspired, could enter the houses of the most powerful sirdars and openly off the choice of their goods and horses, or whatever he took a fancy to. He also levied " black mail" oft the chiefs, demanding large sums of money for the expences of himself and followers; and if his demand was not immediately complied *with, the contumacious sirdar might expect to be plundered of all his property. Even Runjeet himself was not Exempt from this impost, which he was content to bear in common with his sirdars. The Maharajh, however, prudently strove to conciliate the powerful free-bowter, by yielding to hi* demands with a good grace, and sometimes indeed by anticipating them. He frequently bestowed gifts of money and jaghires on the Akalee leader and his followers, and thus in some degree secured their forbearance and friendship. At length it occurred to the sagacious Runjeet to turn to his own advantage those qualities and propensities of the Akalee band, under which he had suffered so long. This purpose he attained by taking them into his service, but without insisting very strongly on the enforcement of regular military discipline. It was indeed the prudent policy of Runjeet, whenever knew of any famed and dreaded robber to send for him to his presence, and by presents and the promise of good pay, to attach him to his own service, thereby converting to his own use and benefit, the courage and the rapacity which would otherwise be exercised at his expense. Thus it happened that in most of the battles which Runjeet fought with his Afghan or other foes, the tide of victory was turned in his favour, by the daring and impetuous onslaught of some of these desperate spirits, whose predatory habits while they had given them an. utter disregard for all discipline had inspired them with a thorough contempt for death and danger. Phoola Sing with his small band of Akalees, when taken into the service of the Maharajh, contributed largely on more than' one occasion to win victory to his cause. It .was roii:aK3lee and one of the picked men of Phoola Sing's band, that, without orders, first mounted the half-formed breach at Moultan, in 18i8, with about forty of his comrades at his back, and by this desperate assault made waj- for the entrance of the whole besieging army, which otherwise might have lam before the place for many days longer. It has been* commonly said that this Akalee, whose name was Jussa Sing, was drugged with opium; but this is a mistake, as it is well known this man was a fanatic of such pretensions to sanctity that, contrary to usual practice, he strictly denied himself the use of bhang or soohaJt, the only intoxication drug in use among the Akalees. So pious was he reported to be among his comrades, that he was commonly known as Maullah Sing,—the maullah being the beads which the Seiks use in prayer. However, it was to the desperate" bravary of this man and his followers that Runjeet owed the early and easy captive of Moultan, his troops being so much annoyed by the fire from the fort that they had been compelled to keep close in their entrenchments, where but for this exploit of. Jussa or Maullah Sing, ^Akalee, they might have lain inactive for some time longer. This achievement, however cost the lives of Jussa Sing and thirty-four of his forty followers, who were found, on the capture of the place, lying dead or mortally wounded within the walls. In 1819, Phoola Sing signalised his courage at the capture of Cashmere, on which occasion Runjeet rewarded his bravery with many gifts and favours, and raised him to the rank of a sirdar. He was now a constant attendant on Runjeet's person, and accompanied him in all his campaigns against the Affghans, &c., contributing, not a little to their .successful results. In 1823, a battle was fought at Teree on the northern bank of the Loonda or Cabul river. Victory at first seemed to have declared against the Seiks, for in spite of all that Runjeet with his European generals Ventura and Allard could do to prevent it, a panic spread among the troops, who the point of turning to flee before their Anghan foes. Several unsuccessful attempts to drive the enemy from his position on the Mil of Teree, in which they had been repulsed with great slaughter, had exhausted their strength and broken their spirits, and a shameful defeat seemed inevitable. In vain Runjeet threatened and implored, in vain he adjured* them by their God and their Gooroo to advance, in vain dismounting from his horse he rushed forward sword in hand calling on his troops to follow him,—his threats} his entreaties, his adjurations, and his example were alike disregarded. The troops would not advance, they were beginning to retire in panic flight, and the day seemed lost. Runjeet was in despair and as a last resource was about to betake himself to his prayers and his beads. Just at this critical juncture, however, he saw, to his great joy and equally great surprise, the black banner of Phoola Sing and his Akalees moving along the foot and then up the side of the disputed hill. The Akalee chief at the head of his five hundred desperadoes was advancing against the enemy. 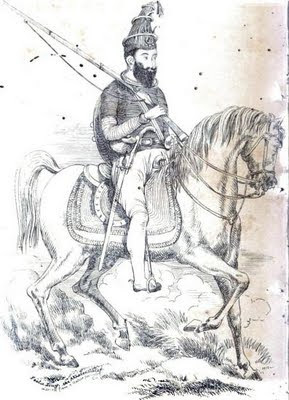 Runjeet had himself seen Phoola Sing, f in the heat of the engagement, struck from his horse by a musket ball which shattered the cap of his knee; he had seen him borne to the rear to all appearance utterly disabled. But there was Phoola Sing seated on an elephant actually leading his little band to the assault. On went the Akalees after their leader who from his elephant shouted an invitation-to the whole army to follow them. The army did not respond to his call, but up the hill and towards the foe went Phoola Sing and his men, determined to decide the fate of the day by a desperate asgault. The Affghans waited not for their attack, but rushed down the hill to become the assailants. At this moment, Phoola Sing ordered his men to dismount and'let their horses go. This was done, and at the same instant the Akalefes shouted their war-cry of Wah Gooroqjee! which ^ tlfTM Alfghans as loudly answered with their Allah ! Allah! The horses set at liberty, either from habit or alarmed by the tumult, rushed" wildly forward and into the ranks of the enemy. This strange and unexpected attack caused some confusion in the Affghan host, observing which the Akalees, throwing down their matchlocks, rushed forward sword in hand with kuch impetuousity as to drive back the enemy, and to secure themselves a footing on the hill. The main body of the Seiks witnessing this success of the Akalees, now took heart, and with a loud sheer rushed forward en masse to take advantage of it. By this movement, a body of twelve or fifteen hundred Afghans was placed betwixt the Akalee band and the advancing Seik army. Finding themselves thus exposed on both sides, they took to flight, endeavouring to elude the Akalees who were above them, and to make their way towards the summit, where their main body, some eight or ten thousand men, was strongly posted. But Phoola Sing was not the man to permit them to escape so easily; he turned and attacked them with such vigour that they were speedily ^ brought to a stand, and in the attempt to check his advance, 'lost above six hundred men. The Akalee force, however, was by this time reduced to little more than one hundred and fifty. Yet this exploit of theirs, had so inspired the main body of the army with courage and spirits that hastening to the support of the little band of heroes, they completely routed the Affghan detachment, and followed up their advantage by a desperate effort to dislodge the more powerful body of the enemy from its positiop on the summit of the hill. Phoola Sing mounted on his elephant led the advance undeterred by the receipt of another musket ball in his body. His Akalees rushed on, in front of the attacking army, eager to close with the enemy. As they approached the position of the Affghans, they were met by a most destructive fire of matchlocks and musketry, which greatly thinned the small party of Akalees who now remained. At this moment the mahout ducted the elephant on which Phoola Sing was seated, having already received three balls in his body, and* being terrified at the close an* destructive fire, hesitated to advance. In vain the chief urged him to proceed directly towards the enemy, the man was panic-struck and seemed rather to meditate a retreat. On this Phoola Sing drew a pistol from hft belt and shot him through the head. He then with the point of his sword urged the elephant forward towards the enemy. He had not, however, advanced muci further when a bullet from an Afghan matchlock entered his forehead, and he fell back in his howdah a corpse. The death of their leader so infuriated the Akalees, that though their first charge was repulsed, they again and again returned to the assault with more desperate resolution, and in the end made a way for the Seik army into the midst of the enemy's position, and dislodged him from the height with great slaughter. Runjeet, now rejoined by many of his troops who had fled at the first reverse, followed up his advantage, and falling on the Aftghans who had again formed at the foot of the hill, put them to flight in the greatest tumult and confusion, numbers of them' hiding themselves in the long grass of a neighbouring swamp where they were cut to pieces or shot down by the victorious Seiks. The loss on the side of the Seiks was upwards of five thousand men, and it was thought that the Afghans lost nearly double that number. This battle of Teree was won for Runjeet, after all hope of victory had fled, by the bravery of Phoola Sing, so gallantly supported by his little troop of Akalees. The heroism of the Akalee chief won the applause of both Seik and Mussulman, and the tomb erected over his remains, on the spot where he fell, although watched and attended by a party of Akalecs, has become a place of pilgrimage for Hindoos and Mahometans alike. It stands at Naoshera, on the other side of the Loonda or Cabul river. Since the days of Phoola Sing, the Akalees have greatly degenerated, aritl are to be found intermixed with men of low castes, as Mujbees, a practice, which edistinguished chief never countenanced or permitted. A true Akalee of the original Jat stock is now rarely to be met with, except aff the different Akal Bhoongahs, as at Umritsir and elsewhere. The real Akalee was bold, free, and assuming to all, but in particular haughty and audacious to those who dared to call or think themselves his superiors in rank or station. He ever strove to win the character of a friend to the poor, and an enemy of the rich and powerful. He was a fanatic in his religion, which was nearly a pure deism, and followed strictly all the rules laid down for his guidance by the great Gooroo Govind Sing. He made no scruple to seize or demand from even a friend whatever he required; but he was equally ready to overpay an obligation. He cared little for wealth, but was content with the mere necessaries of existence. He was regardless of life and willingly - exposed his own to danger at the call of duty. Such was the true Akalee of the stock which produced a Phoola Sing j but the race is now nearly extinct. Before the war with, the British, they had much fallen away, and since that campaign, in which they suffered severely, little has been heard of them. [IT IS UPTO THE READER OF THIS BLOG TO DETERMINE WHICH PARTS OF THIS ACCOUNT ARE A PART OF THE MARYADA OF THE GURU KHALSA PANTH SAHIB.